I started the busy Airwaves week a little early with a songwriting/recording session with the musicians that FBi Radio brought to Airwaves — Rainbow Chan and Oliver Tank. The photo to the left is of Rainbow Chan performing my great-grandpa’s mechanical calculator, which we used in the beat of the song. The three of us have quite disparate musical styles that were difficult to synthesize, especially within the span of an afternoon. But we’re also each individually going to do a remix of the track, which I think will bring out our different styles. I will post those when they are ready. […] mixes Brian Wilson with Ariel Pink and comes up with something truly compelling and original. Just Another Snake Cult’s sound pulls off that rare and peculiar trick of balancing the right influences with just enough originality to blow minds and capture hearts. We like this a lot. Our first show of the week was a live session for KEXP Seattle at KEX Hostel, where our “big group played an endearingly ramshackle set […] with just about any instrument you could find.” Check out more of the nice things they have to say and great photos on their blog. The stage sound was a little difficult (low resonances, feedback — stuff that comes with the territory of being a nine-person band), but the recording quality is fantastic. You can listen to our entire set at our KEXP session archive. This was followed by a string of off-venue performances. At Barbara there was no backline at all, so we performed acoustic without Ási our drummer and had a great time of it. At Reykjavík Backpackers the mixer powering their sound system was on the fritz — it took half our set before we’d shook enough dust out of the thing that all the channels came through. But again, we had fun. At Kaffistofan the jerry-rigged P.A. didn’t look promising, but it held up and to our surprise the sound was great. At this point we were looking forward to playing a real venue, with decent sound. The sound check at Amsterdam was a little disconcerting as a number of the power outlets on the stage were dead, they still needed to round up another D.I., and there wasn’t room for all of us actually on stage. Nonetheless, we managed to get a good sound. By the time we hit the stage that night though, all the mixing board settings from soundcheck had been tossed, one of the monitors was dead, nothing came through right, there weren’t enough working channels left on the board for the band, and between each song the sound guy ran up to tell us that something new had crapped out. We made the best of it. 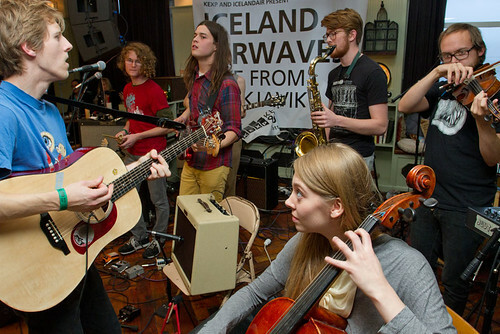 In their review, the Reykjavík Grapevine noted that we left “the audience to endure a 10-minute sound check,” but that then “the keyboard and guitar drove the North English sound along, with the saxophone laying down some fine grooves. Quite fitting music for a small venue like Amsterdam, and the crowd was more than happy to stomp along to it.” Stereogum has assured me that their scathing review of an unnamed Icelandic band was not directed towards us. Sunday was the longest day — traveling around Reykjavík (and Mosfells) with a gang from La Blogothèque recording song after song for an extended Take Away Show. In between we fit in a cold and windy roof-top session for The Line of Best Fit. It was really fun working with them both. I can’t wait to see video from all three–La Blogotheque, The Line of Best Fit, and KEXP. Will post them as they come! Our intensive schedule didn’t leave much time or energy for show-going (let alone that seeing many bands entails either waiting in a queue for an hour or showing up hours early and waiting inside the venue) and so I missed out on a lot of bands that I would have liked to have seen. Of what I saw, the highlight of the festival was Yoko Ono Plastic Ono Band. Her music (or specifically, her singing) is something that dares do something different. Was it good? I don’t know. But it burned itself onto my brain in a way music generally does not do. More music should strive to be so striking, and in such a human way. Couple that with like the coolest backing band ever — double-drummers (one of which was Greg Sonier of Deerhoof! ), Sean Lennon, etc etc. It was pretty sweet. Tune-Yards even came on stage mid-set, which I have great footage of, but no steady internet connection to upload it. 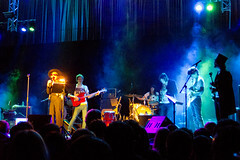 The Reykjavík Grapevine actually has a good review of this show, if you’re still curious.